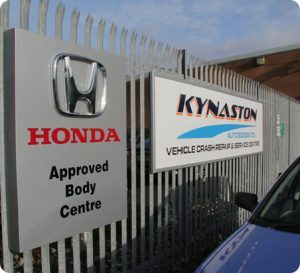 Since we began trading in 1971 Kynaston’s has grown dramatically becoming one of the largest Honda approved and Kia approved body shop repair centres in the South West. We are also an aluminium specialist repair centre that is unique to the South West and specialises in Jaguar and Nissan repairs. We have vast experience working on all makes of vehicles and vans including Audi, VW, Seat, Skoda and Mercedes. With our various sites occupying more than 40,000 sq. ft., we have the capacity to provide you with first quality service for you and your car at every stage of the repair. We have three sites in Exeter, covering body shop repair, commercial repair and an MOT and servicing centre, where our specialist and experienced technicians have the knowledge to repair all makes of vehicles. Our commercial site has been developed specifically to deal with your commercial and fleet vehicles up to 7 and a half tonnes using the latest technology. Paul our Managing Director keeps a hands-on approach to each of his sites, working closely with his senior management team and all members of his staff. Focusing on quality customer care where the customer’s needs are always put at the forefront, the friendly team will be happy to help you and take care of your vehicle. So, if you would like professional attention to your vehicles, with a “done in one” approach to completing all of your mechanical and body work requirements, then please don’t hesitate to contact us. From small beginnings in 1971 when Paul Kynaston (Managing Director) set up what was then known as Kynaston’s Coachworks in a single bay garage down on the Quay in Exeter, to a site in King Edward Street for 21 years, the company then moved to Marsh Barton in 1988 where we took on our current name of Kynaston Autobodies where we became Ltd. In 2009 we opened a bespoke mechanical repair, service and MOT centre. This offers the public and fleet users services they require at independent labour rates. Our highly trained technicians and excellent team are able to work on all makes of vehicles. In May 2013 as part of the Exeter Repair centre refurbishment, we relocated to a 28,000 sq. ft. centre to accommodate our growing business demands, allowing our previous Marsh Barton site to become specialised as a commercial site. 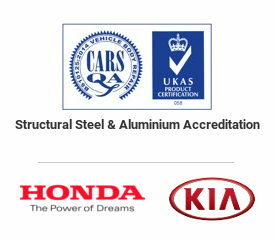 We are now proud to offer you the services of one of Exeter’s largest Honda & Kia approved independent body shops. We are also VW/Audi Group specialists. 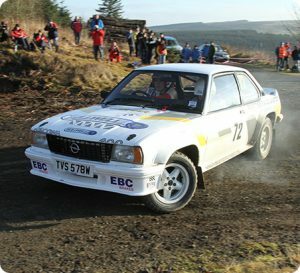 Paul Kynaston has been involved in both modern and historic rallying since 1970 and has been successful in winning many championships in his various rally cars over the years. In addition to his passion of rallying, restoring and driving his private collection of classic cars, Paul has most recently embarked on other projects to restore classic motorbikes and tractors.